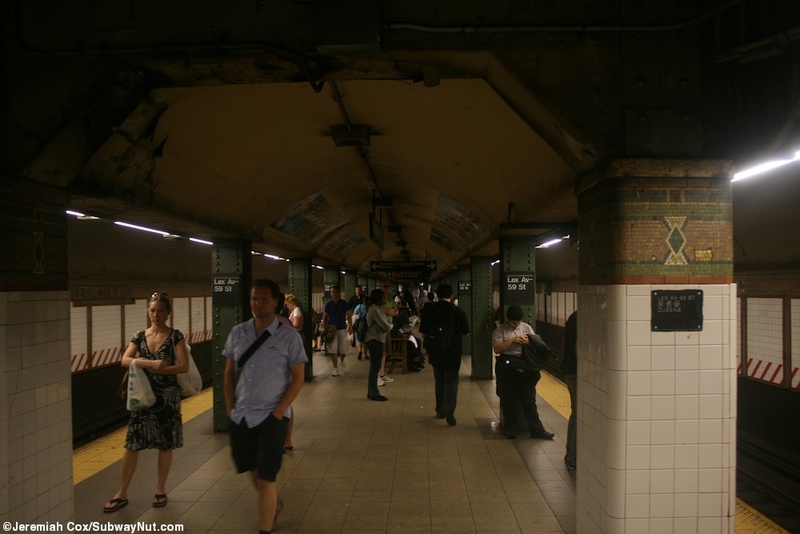 The BMT Lexington Avenue station goes through the middle level of the IRT station, between the upper-level local platforms and lower-level express platforms. 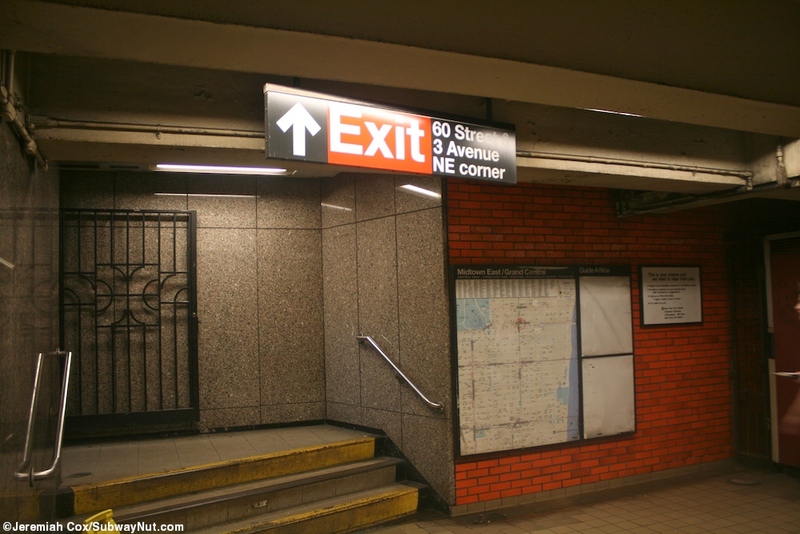 The stop has a single relatively narrow island platform that was renovated in 2002 and has a brown with a green boarder trim-line along the platform walls. 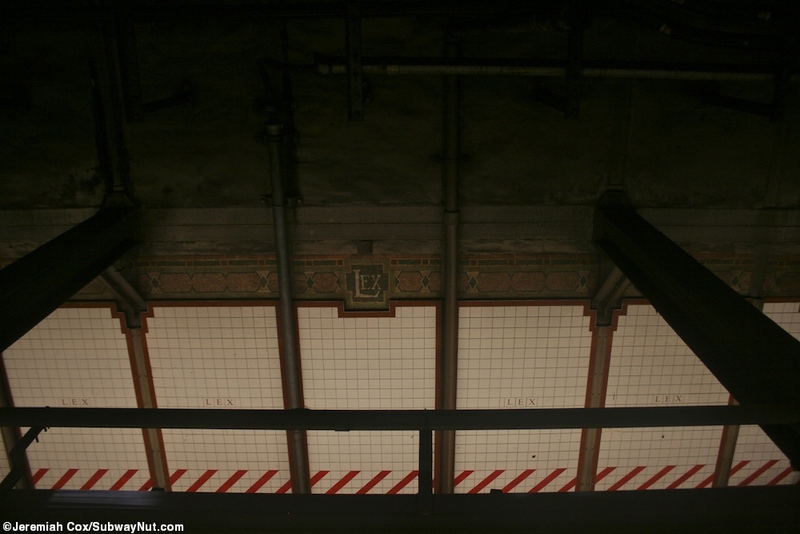 There are L's in it in the portion of the station that was the extension (closer to the 3 Avenue end of the station), with Lex written in the original portion of the trimline towards the Lexington Avenue end of the platforms. 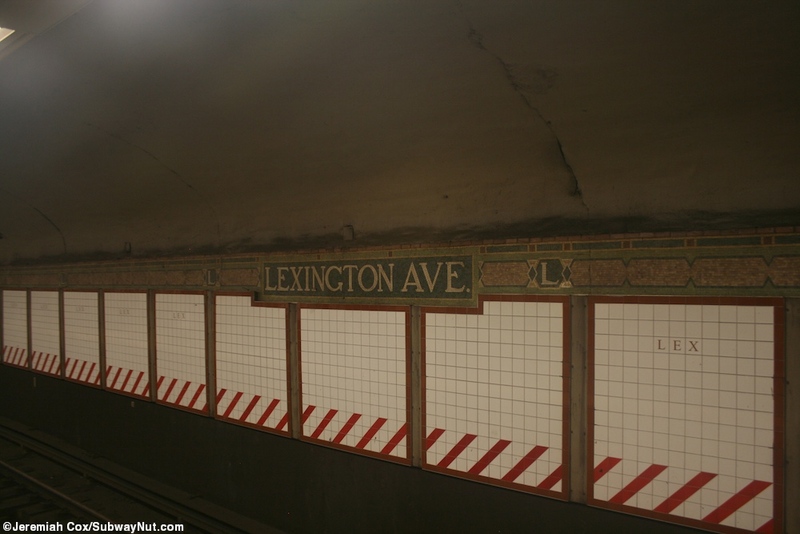 In the extension portion of the trimline there are also Lexington Ave name tablets interrupting the trimline. 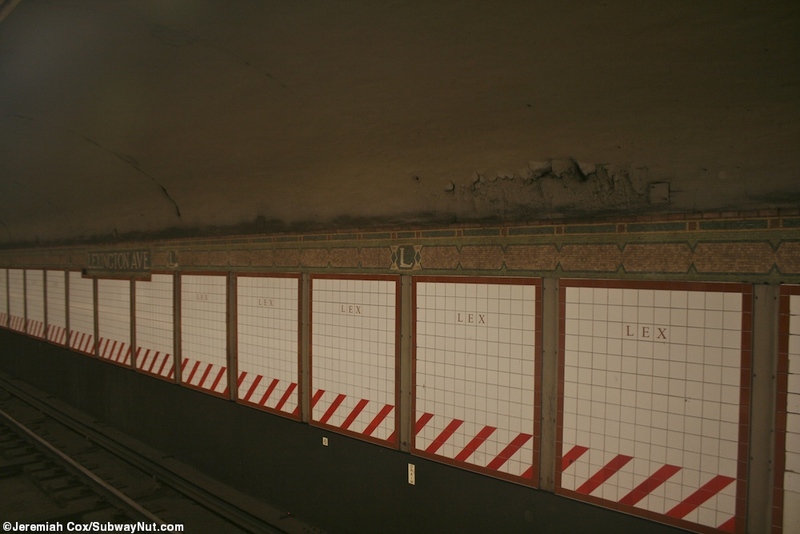 Beneath the trimline are modern modular white tiled wall panels with a red boarder (and the required red angled stripes warning track workers of the no clearance zone along the track walls) and LEX written on some of the tiles on red. 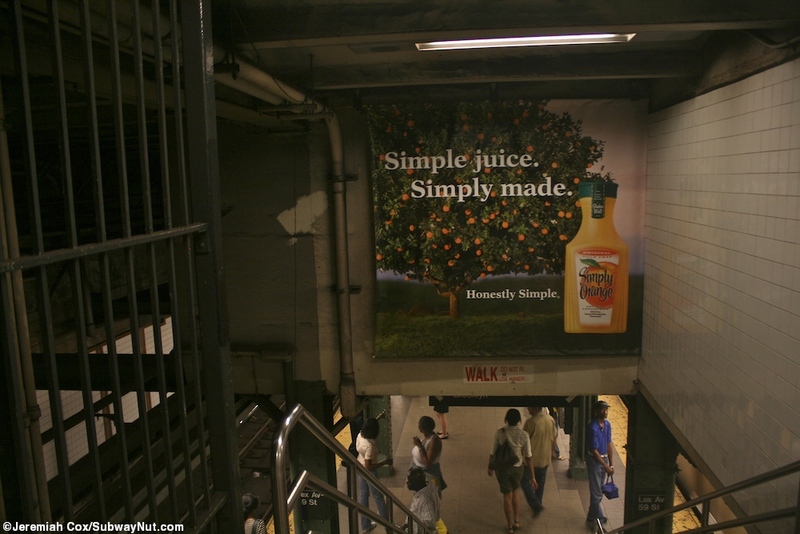 The platform benches are of an unusual non-standard wooden design. 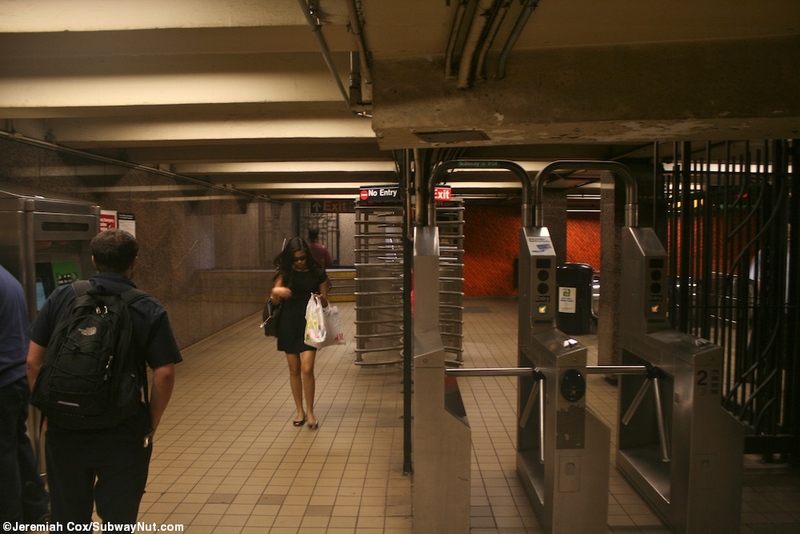 For exits: the only one that leads directly down to this level is at the extreme eastern (railway north end). 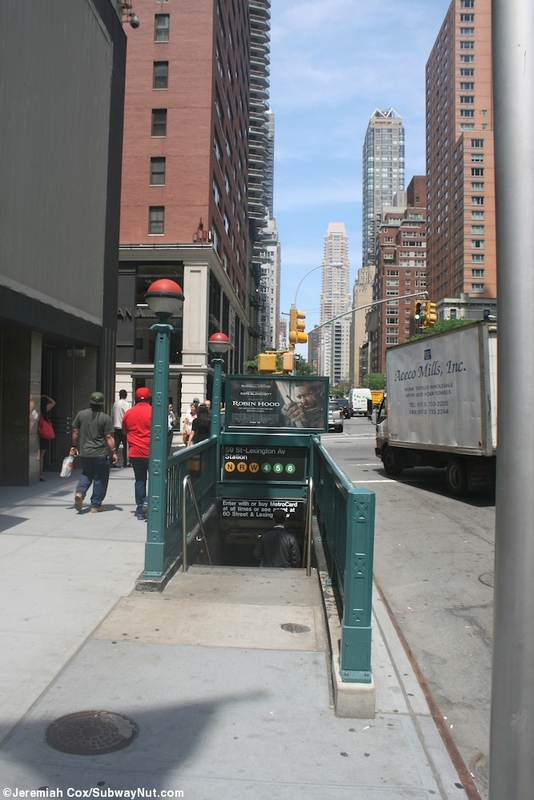 Four street stairs, one from every corner of 3 Avenue and 60 Street, lead down to a small mezzanine area beneath the street where fare control is, consisting only of regular turnstiles, with a couple of High Exit Only Turnstiles for quicker exits to the street stairs to the western side of the street. Presently the entrance is open full time but is unstaffed with a former customer assistant booth. 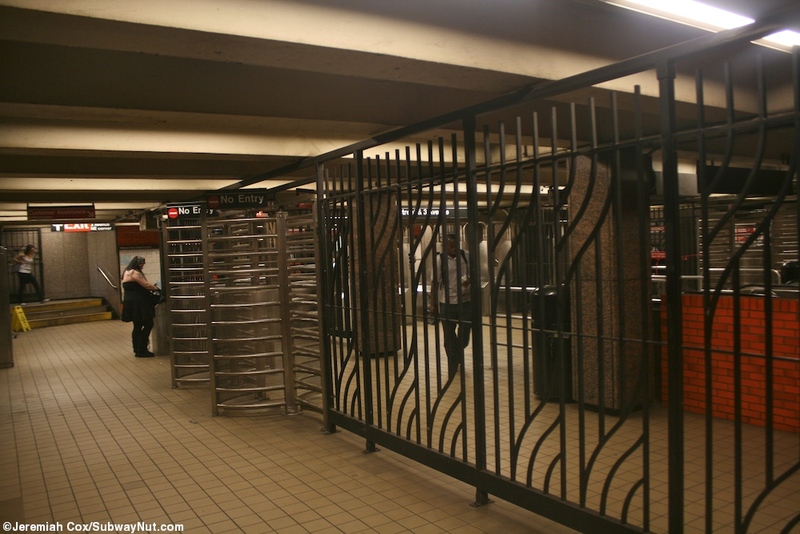 All street stairs and the entrance to the platform have now always open gates making this exit easy to close off which were used during off-hours when it used to be closed. 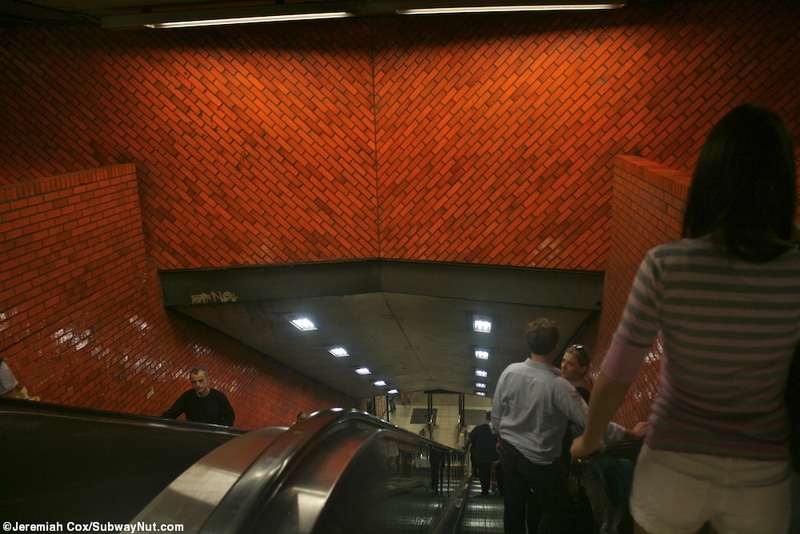 This entire entrance area was built in the 1960s and has the design features of that era with faux-marble along the mezzanine walls, and the orange tiling (that is similar to Bowling Green and 49 Street) that line the two escalators with a very narrow staircase between them shaft that arrives at the extreme eastern end of the BMT platforms. 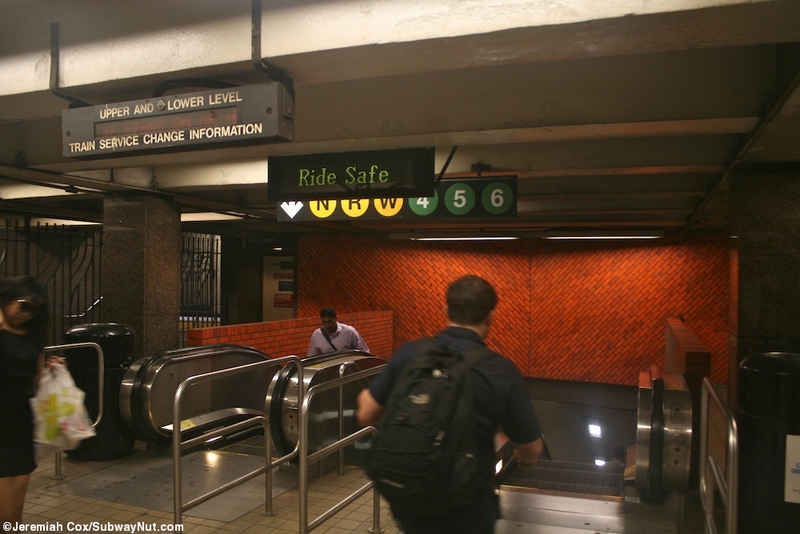 The stations exit and transfer to the IRT are towards its western (railway south) end. 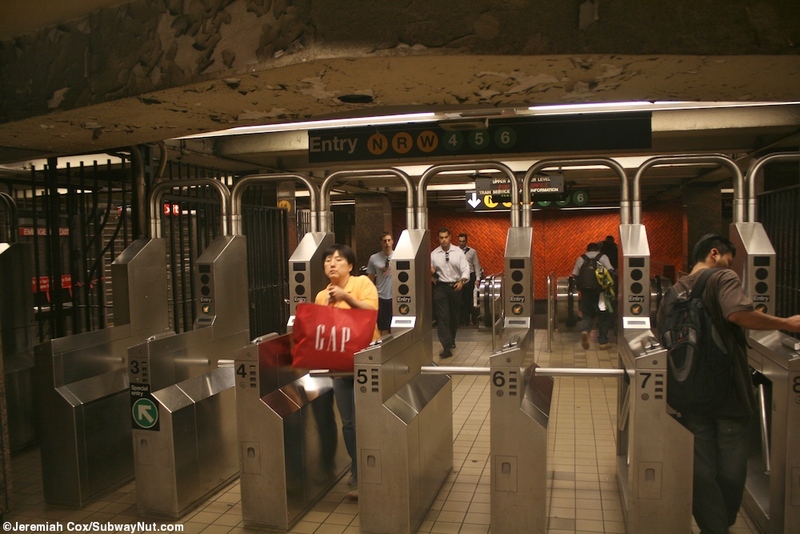 To reach each of the upper-level platform fare control areas to 60 Street and Lexington Avenue two staircases lead up from the island platform respectively to similar small passageway intermediate level. 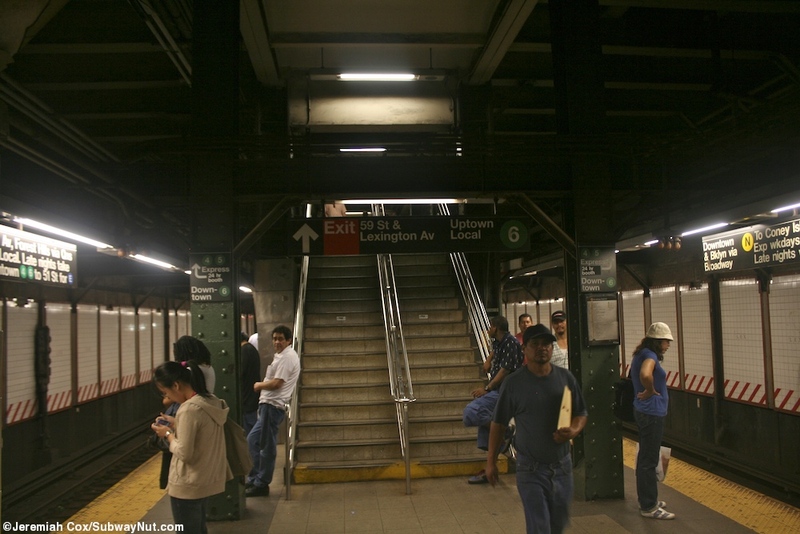 For access to the uptown platform they form two staircases, the downtown, one. 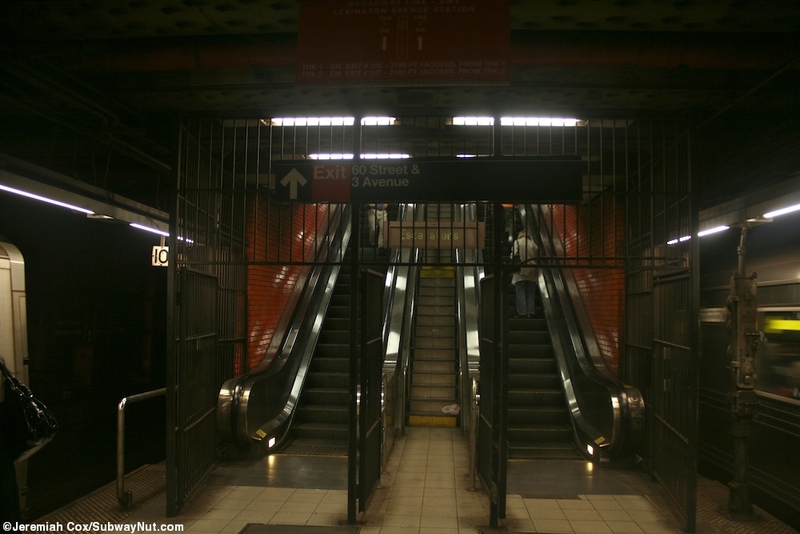 There is also an escalator up directly from this platform to only the downtown 6 platform. 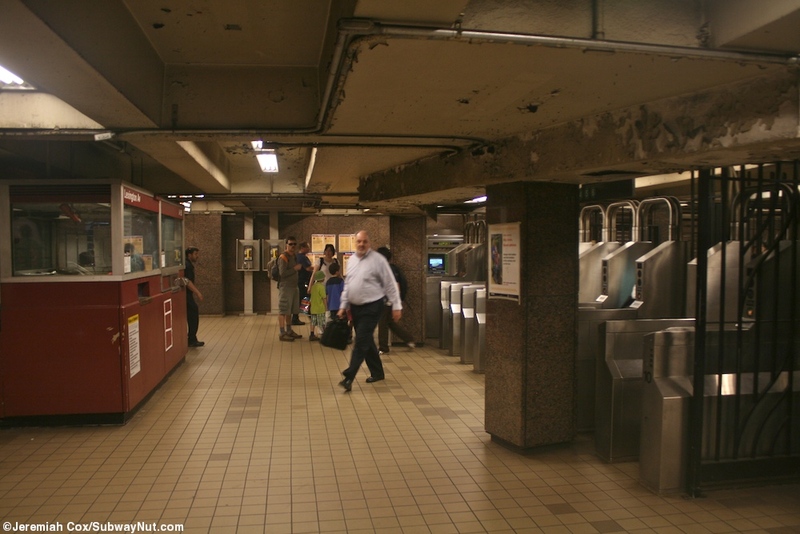 To reach the lower-level downtown express platforms, located beneath this intermediate platform three down staircases lead to an intermediate mezzanine between these portions of the station where two staircases lead down to each of the lower-level express platforms.